Less than eight hours after UFC president Dana White professed the winner of the Nate Diaz vs. Jim Miller shootout on May 5th would get first dibs at Benson Henderson’s freshly-minted lightweight crown, White has once again changed course and decided to grant Frankie Edgar (Pictured) an immediate rematch. 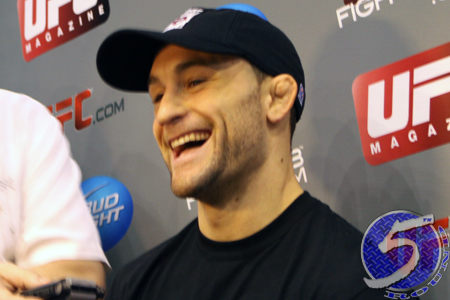 “Frankie Edgar and Ben Henderson rematch will be this summer,” White tweeted just minutes ago. Edgar dropped a highly controversial (49-46, 48-47, 49-46) unanimous decision defeat to Henderson last month at UFC 144. It was a typical Edgar fight, where most of the rounds were very difficult to score and were decided by a punch here or a kick there. Although Edgar exited the 25-minute affair with his left eye sealed complete shut, he was adamant that he should have left Japan with his title in tow. While White was desperately trying to persuade Edgar to shed 10 pounds and drop to the featherweight division, where he would have instantly entered into a championship affair against 145 pound king Jose Aldo, Edgar remained hellbent on arranging a sequel with Henderson. “Rematch anyone? ?…….it’s on!! Thanks to @danawhite @lorenzofertitta. Me and Henderson 2. Here we go! !” Edgar posted immediately after White’s announcement. Edgar is now the only fighter in UFC history to compete in six consecutive title fights, with half of them being of the rematch variety. Edgar initially captured the crown in April 2010 by posting a unanimous decision win over BJ Penn, who most believed was the greatest 155-pounder mixed martial arts had ever seen at that point. Although he was forced to grant Penn an instant rematch, the results were the same – except his victory was even more convincing in the second go-round. Edgar then fought Gray Maynard to a controversial draw at UFC 125. Although White initially claimed he wouldn’t arrange an immediate do over, he promptly changed his mind less than an hour later. Edgar responded by rallying from an opening round onslaught to put his nemesis to sleep in the 4thRound this past October. Like a true champion, Henderson has claimed since day one that he’s down to defend his belt against anyone, including Edgar.